The paramilitary upturn in Chiapas is accompanied by a substratum of alleged agrarian conflicts, the majority unfounded but stirred up by politicians from the parties and government officials, and directed against lands recuperated by the support bases of the Zapatista National Liberation Army (EZLN, its initials in Spanish), the majority occupied and worked by rebel communities since 10 or 15 years ago. In particular groups from the PRI, and recently the PVEM, using it as an electoral booty, invade or threaten to invade, plots of land and even Zapatista villages, taking advantage of the fact that they, by remaining in resistance, do not process any agrarian titling with the State, because they follow their revolutionary laws through the Good Government Juntas (Juntas). An analysis to which La Jornada had access documents these “conflicts” and identifies the invader or aggressor groups: PRI, PVEM, PRD, PAN, or rather organizations like Paz y Justicia (and its derivations: Uciaf and Opddic), Orcao, Cioac or Aric. In one very recent denunciation, Las Abejas confirmed the reactivation of “Máscara Roja” (Red Mask) in Chenalhó, as it has identified the perpetrators of the Acteal Massacre in 1997. Other Campaign communities (Jotolá, Mitzitón, San Sebastián Bachajón) are also attacked through religious “conflicts” (Ejército de Dios) or ejidal differences. This is the scenario that the PVEM-PRI alliance headed by Manuel Velasco Coello inherits, which shortly will govern the state. The major part of the paramilitary groups, agrarian invaders and municipal governments involved belong to their ranks. In an analysis of the investigator Arturo Lomelí identifies the principal places (not the only ones) where offenses and unsolved crimes have happened in recent years, especially from 2010 to 2012. He points out in there that starting with 1994 between 250,000 and 750,000 hectares (there is no conclusive data)  were occupied en Ocosingo, Chilón, Sitalá, Yajalón, Tila, Tumbalá, Sabanilla, Salto de Agua, Palenque, Altamirano, Las Margaritas and Comitán, among other municipalities. Under the protection of the Zapatista rebellion, OCEZ, Cioac, ARIC, CNPA, OPEZ, Xinich, Orcao and Tsoblej, side by side with the Zapatistas, “recuperated” and founded new localities. In 2000, when leaders of said organizations were incorporated into the state or municipal government, “they were given the task of regularizing (legalizing) the plots of land and as the Zapatistas did not enter into those negotiations, the organizations claimed their plots of land.” These organizations are the electoral base of the parties –Lomelí maintains– and the dynamic of betrayal initiated by Pablo Salazar Mendiguchía was maintained with Juan Sabines Guerrero. The conflicts involve the five Juntas. The Morelia Junta has been very busy. Primero de Enero community (Lucio Cabañas autonomous municipality) was invaded in August 2011 by Orcao members, who already had obtained lands thanks to the Zapatista Uprising. As in other cases, after 2000 they abandoned the agreement to “recuperate” and reached agreement with the government for programs and more of the Zapatistas’ land. Orcao has also advanced against Los Mártires (Lucio Cabañas). 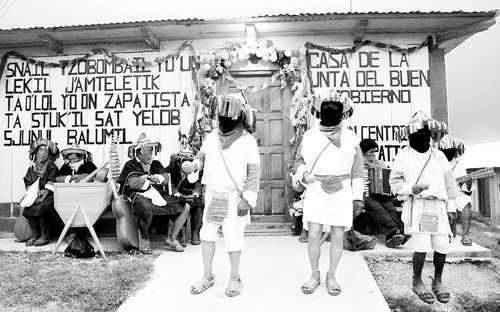 Other communities and plots of Zapatista land under siege are Bolón Ajaw and Santa Rosalía. In Agua Clara (Comandanta Ramona autonomous municipality) “dangerous criminals operate, advised by the ex military Carlos Jiménez López.” In 2010, residents of Nueva Virginia, Jalisco and Getzemaní, members of the Cioac and the PRD “entered onto Campo Alegre recuperated land where the autonomous municipalities of Lucio Cabañas, Comandanta Ramona and 17 de Noviembre are working,” according to the same Junta. Besides, 33 Zapatista families were dispossessed of their rights in Aldama, and the attacks against the support bases in Olga Isabel and K’an Akil persist; they have even been shot at by “paramilitaries of Opddic,” which also have attacked the new 21 de Abril community. The La Garrucha Junta denounced that the Puerto Arturo and San José Las Flores neighborhoods seek to take away 178 hectares of recuperated land from Nuevo Purísima (Francisco Gómez autonomous municipality) in Ocosingo. Also, aggressions and detentions of Zapatistas by paramilitaries in Peña Limonar, as well as plunder in Laguna San Pedro, violence in Casa Blanca and harassment in Toniná. Groups from Las Conchitas and P’ojcol (Chilón), as well as Guadalupe Victoria, “paramilitaries,” according to the Junta, members of Orcao and of political parties, violently occupied recuperated lands in Nuevo Paraíso (municipio Francisco Villa autonomous municipality). In the Northern Zone, the panorama is alarming, according to what the Roberto Barrios Junta has been reporting. Last year, Zapatista lands in San Patricio (La Dignidad autonomous municipality) were plundered from Zapatista lands by villagers from Ostealukum, El Paraíso, El Calvario and Rancho Guadalupe (Sabanilla). The autonomous Zapatistas then founded Comandante Abel, but this September they were expelled, with support from the police and the state government, as well as from Unión Hidalgo. A few years ago, in Choles de Tumbalá (El Trabajo autonomous municipality), there were houses burned and persecution by members of Xinich-Official (official implying pro-government and anti-Zapatista). The La Realidad Junta documented how in the Monte Redondo ejido (Frontera Comalapa), EZLN support bases of Tierra y Libertad autonomous municipality were plundered of milpas and coffee fields by people from the PVEM, PRD and PRI political parties that even sold plots of land to third parties. Other aggressions come from the PAN organization known as Aciac against Che Guevara community, and in Espíritu Santo by people from the PRD, Cioac and PRI. And in Veracruz (community), there were attacks on the warehouse belonging to San Pedro de Michoacán autonomous municipality. Lastly, the Oventic Junta confronts a grave conflict in San Marcos Avilés (Chilón), where its bases have been attacked, expelled or robbed by “Greens,” and both PRD and PRI members. In El Pozo, Cruztón and Ts’uluwits (San Juan Apóstol Cancuc autonomous municipality), as well as in Zinacantán, the PRI and PRD members have not stopped harassing the Zapatistas.